(Milton, Del., March 29, 2019) – 95… That’s the number of calories in the newest full-flavored IPA from Dogfish Head. SLIGHT in cals and carbs with MIGHTY hop flavor, Slightly Mighty – a crisp, new lo-cal IPA – starts shipping next week. This true indie craft beer has all the aroma and flavor of a world class IPA but with only 4% ABV, 95 calories, 3.6g carbs, 1g protein and 0g fat per 12oz serving. Dogfish Head is pioneering the culinary goodness of monk fruit in this off-centered IPA. Monk fruit is an ancient Chinese delicacy that’s sweeter than sugar per ounce, so it amplifies the body and complexity in the beer, yet contains no calories. Hazy gold in color, Slightly Mighty throws tropical notes of pineapple, coconut, mango and citrus, all while delivering aromatic hop awesomeness that makes it so drinkable. Brewed with ‘lo-cal’ly grown malted barley, this beer is complex and fruity with a crisp and refreshing hop profile. Slightly Mighty will be available in six-packs and 12-packs of 12oz cans and on draft. 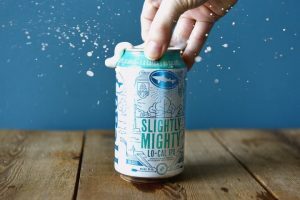 Slightly Mighty will start shipping to select markets starting April 1. Select markets include – MA, DC, MD, DE, IL, IN, MN, SD, WI, VA, IA, KS, MO, NE, PA, WV, NJ, KY, OH, MI. Additional states will be added throughout the Summer with full distribution by this Fall. Dogfish Head has proudly been focused on brewing beers with culinary ingredients outside the Reinheitsgebot since the day it opened as the smallest American craft brewery 24 years ago. Dogfish Head has grown into a top-20 craft brewery and has won numerous awards throughout the years including Wine Enthusiast’s 2015 Brewery of the Year and the James Beard Foundation Award for 2017 Outstanding Wine, Spirits, or Beer Professional. It is a 350+ coworker company based in Delaware with Dogfish Head Brewings & Eats, an off-centered brewpub and distillery, Chesapeake & Maine, a geographically enamored seafood restaurant, Dogfish Inn, a beer-themed inn on the harbor and Dogfish Head Craft Brewery a production brewery and distillery featuring The Tasting Room & Kitchen. Dogfish Head supports the Independent Craft Brewing Seal, the definitive icon for American craft breweries to identify themselves to be independently-owned and carries the torch of transparency, brewing innovation and the freedom of choice originally forged by brewing community pioneers. Dogfish Head currently sells beer in 44 states and Washington D.C. For more information, visit www.dogfish.com, Facebook: @dogfishheadbeer, Twitter: @dogfishbeer, and Instagram: dogfishhead.